Paradise Lost is sublime poetry. The first type of sublime is often found in antiquity, while the second is characteristic of the Romantic period. 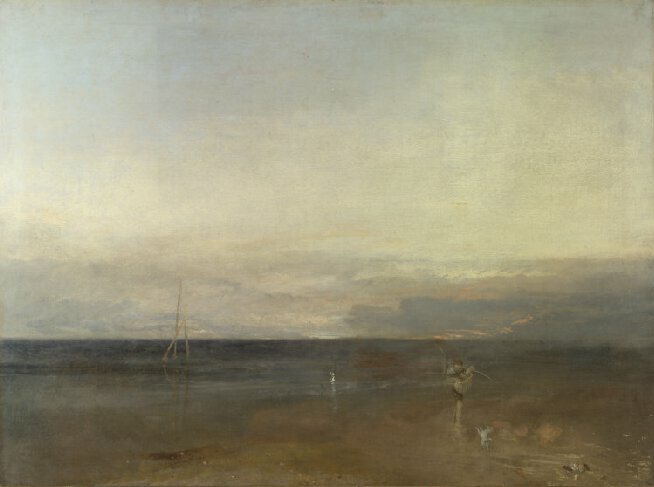 The Romantic period sought the sublime by emphasizing the rough, awesome, frightening aspects of nature. 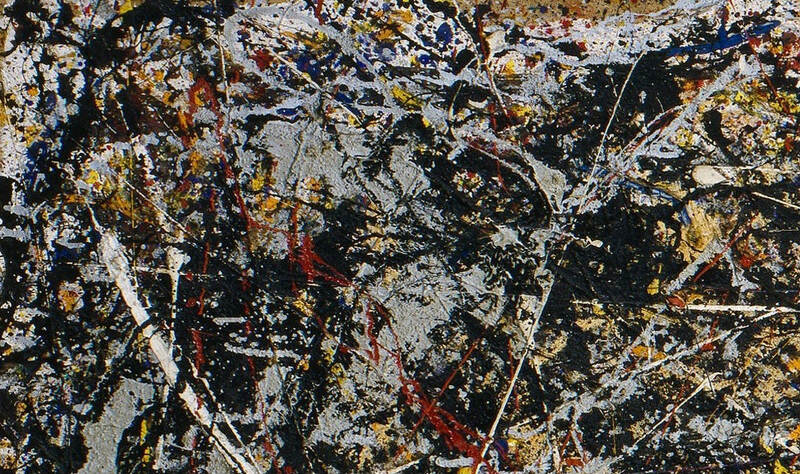 Around 1950, painters in the so-called New York School developed an Abstract Sublime. 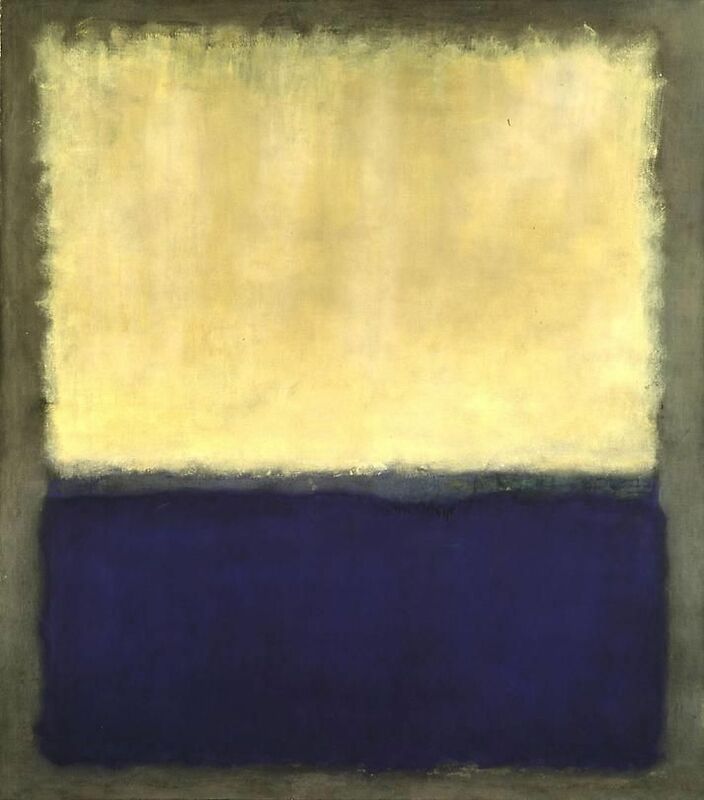 By exploring the topic of the sublime, we can get a better understanding of ancient art, Romantic art, and modern art. Longinus, who wrote On the Sublime, equated the sublime with large ideas and strong emotions. He said that the sublime is the product of a great soul, and it speaks to the great soul within each of us. Longinus wrote in Greek, and probably lived around 50 AD, but nothing is known about him, and scholars have long debated who really wrote On the Sublime. In 1739, an English scholar named William Smith translated On the Sublime into English, and it aroused keen interest among English intellectuals. One of the readers of Smith’s translation was the young Edmund Burke; while still a teenager, Burke wrote a treatise on The Sublime and Beautiful (1757).1 Burke’s book influenced German writers on aesthetics — Lessing, Schiller, Kant, etc. So Longinus’ book has had considerable impact on aesthetic theories — perhaps a greater impact than any work other than Aristotle’s Poetics. Stendhal said that beauty is a promise of happiness, but the sublime doesn’t promise happiness, it provokes awe and wonder. When the astronomer tells us about supernovas, black holes, and the Big Bang, he isn’t promising happiness, he’s provoking awe, wonder, and perhaps fear. I’ve wandered far from Longinus. Forgive me, I’m dealing with a topic that’s formless and boundless, so I should be excused for writing a formless essay. One question that Longinus deals with is, Why has oratory declined? Why has oratory become merely an exercise in style? This topic was much discussed in the first century AD. Petronius blamed the schools of rhetoric for the decline of oratory. Tacitus blamed the rise of the principate, and the fall of political freedom. Longinus argues that the sublime requires a great soul, a high spirit, and this is undermined by despotism, and by moral decay. As Mencius said that only a good man can write good prose, so Longinus argued that only one who possesses “moral excellence” can create great literature, can attain the sublime. The sublime is the product of a great soul, and it speaks to the great soul within each of us, and creates a bond between writer and reader. The sublime can also mold us, it can foster the great soul within us, it has educational power. Thus, On the Sublime deals with ethics as well as aesthetics. It’s likely that Ward had read Burke, or at least heard his ideas discussed. We recall that, according to Burke, “Greatness of dimension is a powerful cause of the sublime.” Ward emphasizes the vastness of the cliff by juxtaposing it with tiny figures of cattle. 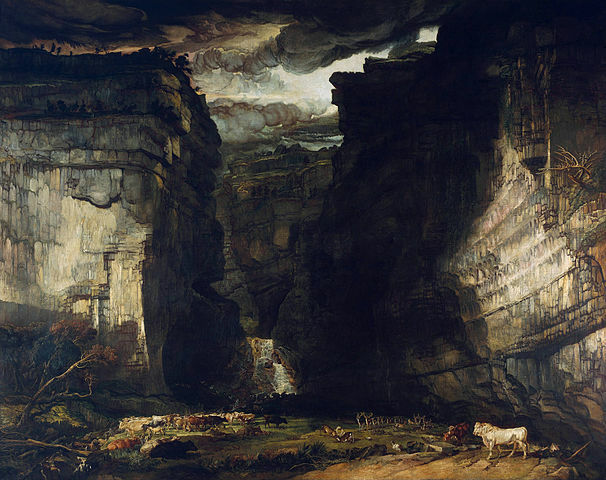 Burke also said that obscurity is a cause of the sublime: “In painting [wrote Burke], a judicious obscurity in some things contributes to the effect of the picture.” Ward achieves this “judicious obscurity” by depicting Gordale Scar on a dark day, and by filling his canvas with dark shadows. Poe was familiar with the aesthetic theories of Burke, Schiller, etc. Poe’s interest in the sublime is evident in his critical essays and also in his imaginative works. When Poe writes a story about a boat being sucked into a giant whirlpool, he’s depicting the awesome, frightening aspects of nature, he’s striving for the sublime.10 Poe’s interest in the sublime is characteristic of his period, the Romantic period. Poe’s treatise on the universe, Eureka, begins by asking, “What terms shall I find sufficiently simple in their sublimity — sufficiently sublime in their simplicity — for the mere enunciation of my theme?” Notice that Poe strives for the sublime, he searches for the right “terms,” whereas primitive writers, like the author of Beowulf or The Book of Genesis, reach the sublime without striving, reach the sublime naturally and effortlessly. 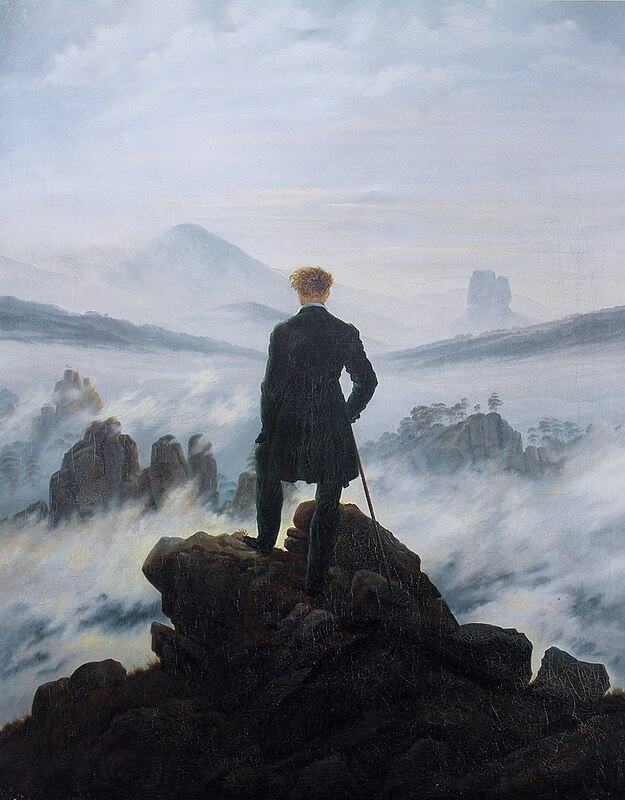 Let’s look at another painting from the Romantic era, another painting in which the sky is obscured (as in Gordale Scar) by heavy weather. 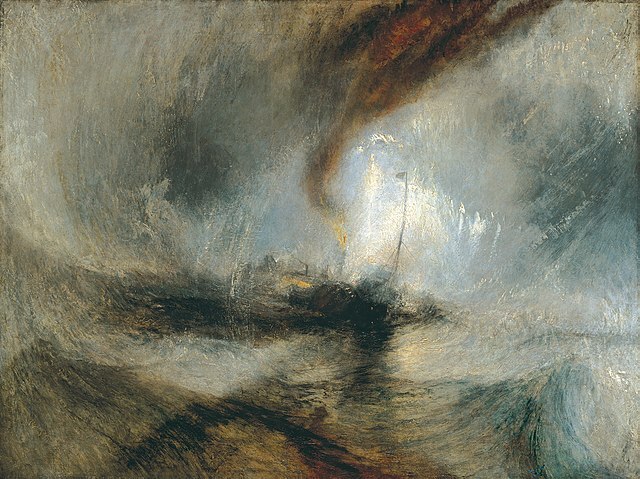 This painting is by Turner, and is called Snowstorm: Steamboat off a Harbor’s Mouth. 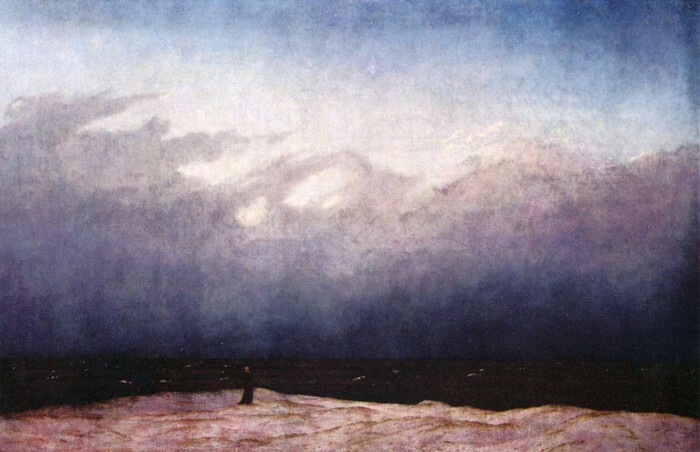 Chinese landscapes often include a solitary person, but the person isn’t turned directly away from the viewer, as in Friedrich’s Wanderer. 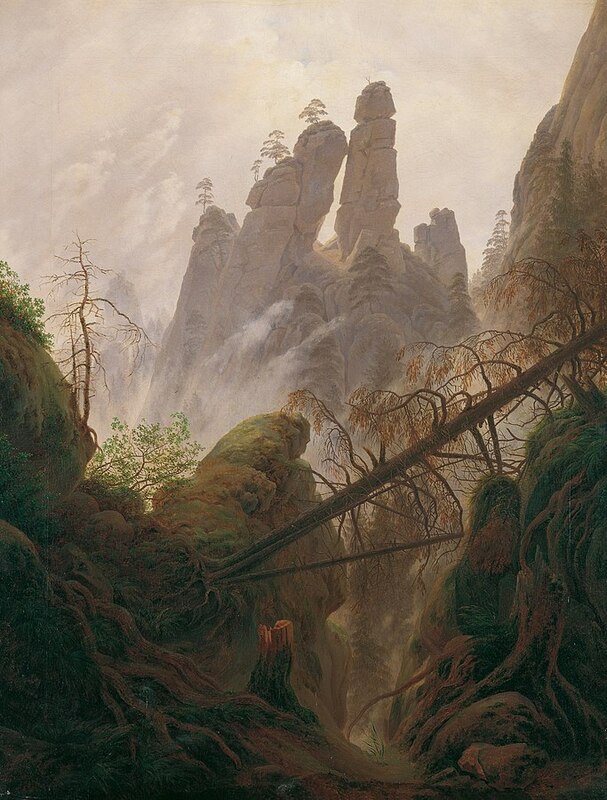 And the person in Chinese landscapes isn’t as large, relative to the landscape, as the person in Friedrich’s Wanderer. The Chinese developed an appreciation of the sublime, an appreciation of “mountain glory,” before Europeans did. Here’s a Chinese landscape from about 1000 AD; you can just barely make out a group of travelers in the bottom right, beneath the towering mountain. This Chinese landscape reminds us of the huge, steep cliff in James Ward’s Gordale Scar. 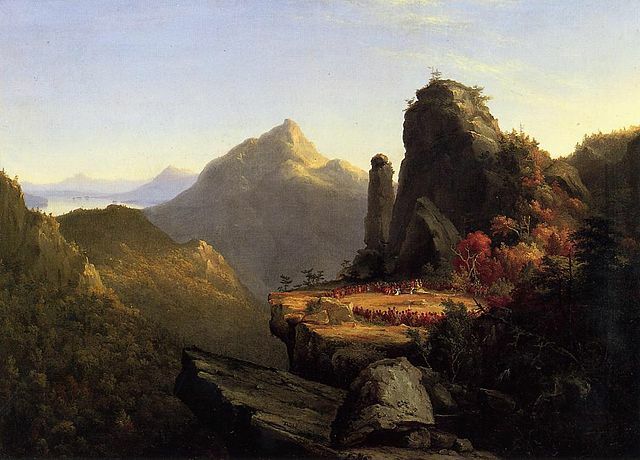 In the painting below, Friedrich depicts a rough, rocky, steep scene. No place for a picnic here, so you know it’s sublime, not beautiful. The recent riot in Charlottesville began with a dispute over whether to remove a statue of Robert E. Lee. There are now “statue disputes” all over the South. Statue disputes occur in other countries, too; in Russia, there were disputes over Stalin statues, and China will probably have disputes over Marx statues. Meacham’s argument overlooks the fact that Washington, Jefferson, and Jackson weren’t faced with the choice that Lee was faced with. Lee felt that federal troops were invading Virginia, his home state, and were bent on destroying states rights. The Constitution didn’t explicitly say whether states had the power to nullify federal laws, or the power to secede from the Union. Southerners viewed the complex issue of states rights differently from Northerners. Grant said that no army had ever fought for a worse cause than the Confederate Army. But who can doubt that, if Grant had been born in Virginia or Alabama, he would have fought for the Confederacy, he would have espoused Confederate arguments about states rights, and he would have believed that Confederate states were fighting, not for slavery, but for their rights? Lee is one of the heroes of American history, but he was caught in a tragic situation, a tragic conflict. He had no good option, and he hesitated a long time before deciding to throw in his lot with the Confederacy. But even if we regard Lee as a hero, it doesn’t follow that statues of Lee should stay permanently. Many Confederate statues were probably erected, not only out of respect for Confederate heroes, but also as a gesture of defiance toward the North. Many Confederate statues probably shouldn’t have been erected in the first place. On the other hand, should an angry mob with a strong rope be allowed to remove statues? The Charlottesville riot indicates the fraying of the social fabric, the polarization of American politics. Both Left and Right talk occasionally of separation/secession. Many of the right-wing marchers in Charlottesville were carrying guns, so the next such riot could become a street battle. 10. See Poe’s “Descent Into the Maelstrom” and his “Ms. Found in a Bottle.” Poe was fond of math, and this fondness is apparent in �Descent into the Maelstrom,� �The Gold-Bug,� etc.